Mr. Roger A. Andersen, age 84, passed away Friday, November 2, 2018. He was born in Muskegon, MI on February 18, 1934 to Arnold & Eunice (Northrup) Andersen. Roger was a graduate of North Muskegon High School, the University of Michigan School of Engineering, and the Sloan School of Management at the Massachusetts Institute of Technology. Roger was a lifetime member of the First Congregational Church, where he met Marilyn Verduin in the church nursery school. The two began dating in college and were married on August 17, 1957. 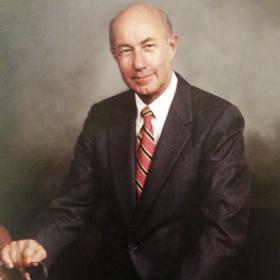 Mr. Andersen was the former President and owner of Lakeshore Machinery and Supply Company and was active in numerous west Michigan organizations, including the Muskegon Rotary Club, the Muskegon Chamber of Commerce, the Greater Muskegon Industrial Fund, the Muskegon Economic Growth Alliance, New Muskegon, and the Michigan Industrial Distributors Association. Roger served many years on the boards of FMB Lumberman's Bank, Hackley Hospital, the Muskegon County Community Foundation, West Michigan Symphony Orchestra, Grand Valley State University Foundation, and the Muskegon Museum of Art, to name a few. An avid sailor, Roger made the Muskegon waterfront a focus of much of his community service, playing a significant role in efforts to bring to Muskegon the Grand Valley State University Annis Water Resources Institute and its W.G. Jackson research vessel, as well as the Lake Express Ferry. In 1998, Roger was honored with the Grand Valley State University Enrichment Award. Roger was also the longest serving member of the Muskegon Rotary Club, which recognized him recently as the inaugural honoree of the Roger A. Andersen Lifetime Community Leadership Award. The award will be given in his name, in perpetuity. A Memorial Service will take place Wednesday, November 7, 2018, 2:00 PM at First Congregational Church UCC with Rev. Timothy Vander Haar officiating. The family will hold a visitation at First Congregational Church UCC, one hour prior to the service, and there will be a reception at the church immediately following the service. In lieu of flowers, donations may be made to the Susan Mast ALS Foundation, the Muskegon Rotary Foundation or the First Congregational Church.